We hold meetings and events for the public and League members. From time to time, we may also feature events on this page that we do not sponsor, but that we believe may be of interest to our members. All the event details are here! What if we didn’t have to wait to see women on U.S. currency? What if anyone could learn about women who made U.S. history in a place where they’ve historically been left out? Click on this link to learn more about this year’s Gala speaker, Rosie Rios, and her Notable Women Project, where inspirations lead to aspirations. Programcomprises the issues that the League targets for concerted study, education and action at local, state and national levels. Program can include both education and advocacy work. The Program Planning process is part of what makes the League a grassroots organization; each League member has the opportunity to influence where the local, state, and national Leagues will focus time, talent and money. It takes the enthusiasm and interest of our members to keep our program vital. You’d never skip voting in an election; you shouldn’t skip the League’s equivalent. The Program Planning process is your voice! Dr. Popat joined Marin Community Clinics as Chief Medical Officer in November 2013. In February 2017 he became Associate Chief Executive Officer and in October 2017 Chief Executive Officer. In these positions he has overseen interdisciplinary and integrated clinical services; transformed the care we provide to be genuinely team-based and in line with patient-centered principles; built and supported Marin Community Clinics dynamic clinical leadership team; and facilitated contracts with medical groups and independent clinicians to provide a broad range of specialty services in­house. 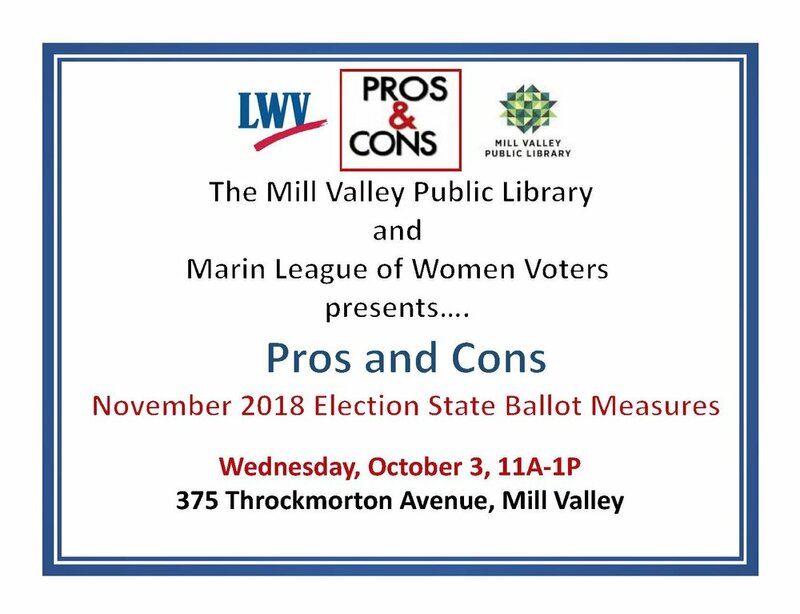 Our League experts will present balanced information about the propositions, and there will be plenty of time for questions. Mindy Romero is the founder and director of the California Civic Engagement Project (CCEP) at the University of Southern California’s Sol Price School of Public Policy, in Sacramento. Her research focuses on political behavior and race/ethnicity and seeks to explain patterns of voting and political underrepresentation, particularly among youth and communities of color in California and the U.S. Ms. Romero’s presentation will talk about her most recent findings, including an update on the Voter’s Choice Act, the implementation of the Vote Center Siting Tool, and her most recent work with the Power of the Youth Vote initiative. $10 donation will help offset costs! "Why I Believe We Can End Chronic Homelessness In Marin"
In this talk, Howard Schwartz will give an insider’s view of the momentum and promising successes achieved in addressing chronic homelessness in Marin over the last two years. Starting with his own experience trying to help an eighty-two year old woman find housing, Howard will recount how he got involved in the transformation that has occurred In Marin County. Howard Schwartz, PhD, is Director of System Change at St. Vincent de Paul Society of Marin, where he has helped support the transformation across the County. Prior to this work , he spent fifteen years in high tech where we was Vice President of sales and marketing for a public company. He has his PhD from Brown University and taught for ten years at various institutions of higher learning including Stanford. Howard has lived in San Rafael since 2010. "Election Security: can we keep our voting systems safe?" Plan to attend the July 9 Monthly Members’ Meeting, hosted by the Governance/Voter Service Committee, to learn more about what you don’t know, and need to know, about securing the vote. As the November mid-term elections draw near, the national news continues to cover concerns around the security of our vote. Are these concerns valid? In today’s political environment, it is not too far-fetched to anticipate that there will be those who will raise the specter of outside tampering with the vote. Understanding vulnerabilities and the steps needed to protect the vote provides a basis for assessing any claims of tampering. voter registration databases, which could be manipulated to block voters and cause disorder when citizens attempt to vote. 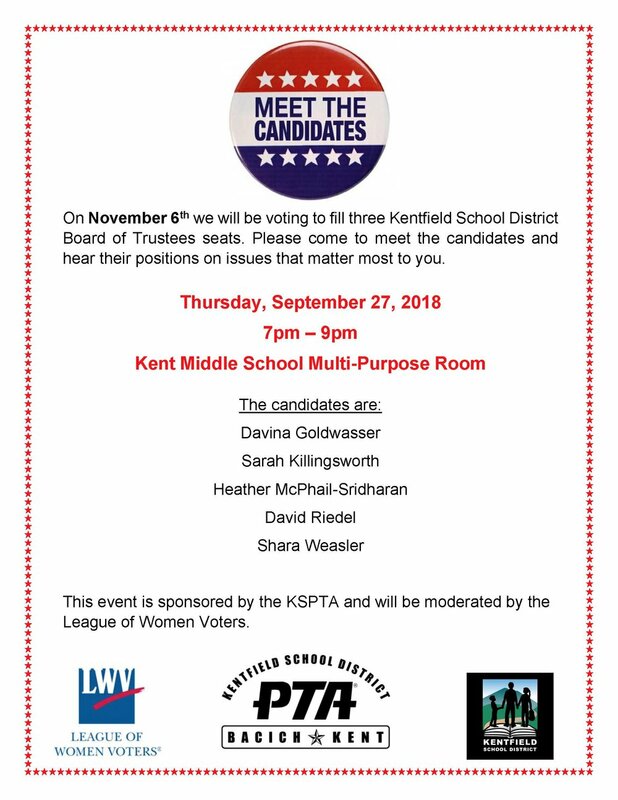 No reservation required; just show up! New members and visitors are welcome! Snacks and conversation 11:30 a.m. 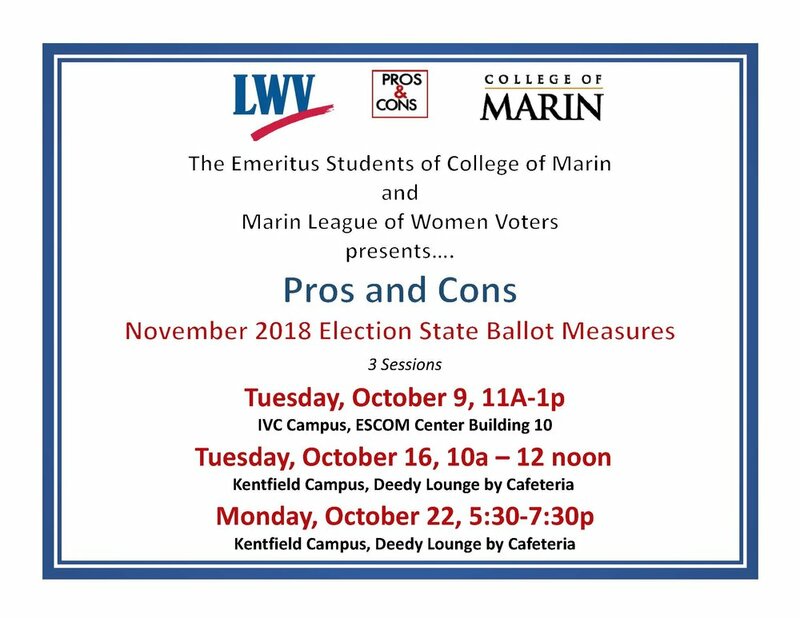 The 2018 Annual Meeting of the League of Women Voters of Marin County will be held on Monday, June 4, 2018 at the McInnis Park Golf Clubhouse, 350 Smith Ranch Road, San Rafael, from 10:30 a.m. to 1:30 p.m. League members and guests are all invited! An Annual Meeting Kit is being mailed to Members and should be brought to the meeting. Be sure to review the full kit before the meeting.